What are you doing this Friday? Coming to Murfreesboro, TN for a rock show, that’s what. And don’t give me none of that, “but I live in the Ukraine. Murfreesboro is just too far of a drive…” nonsense. You can make it. It’s for a good cause and everything. 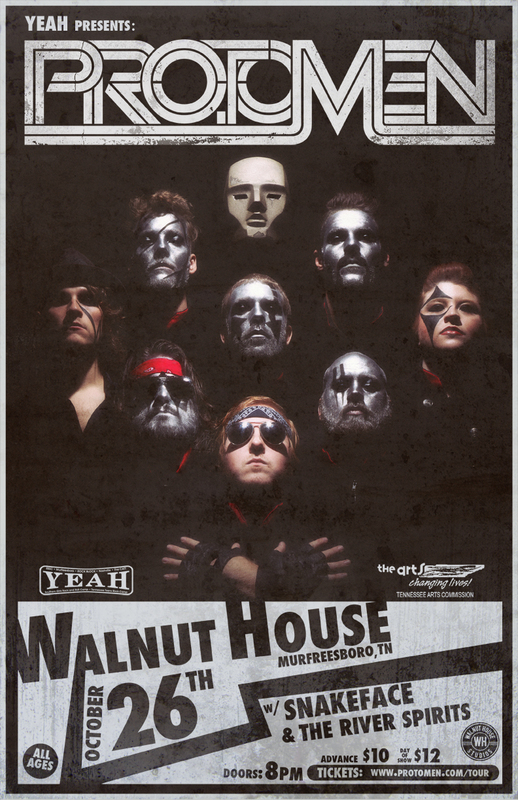 The show is at the Walnut House and is sponsored by the ever awesome YEAH and the Tennessee Arts Commission. The show is all ages, and YEAH will be giving a free live sound and lighting workshop (at 7pm) before the show starts. We’ll also be helping out where we can. Along with that, we’ll be doing a Q&A sort of deal when the workshop concludes. How strange and exciting is that?? Get tickets HERE before they’re gone! If, for some weird reason, you decide that you’re not up to the challenge of driving across the Atlantic Ocean, you can check out what YEAH is up to and maybe make a donation to support their support of rock and roll kids. Also, don’t forget about our three shows in December with I Fight Dragons, MC Lars, and SKYFOX. These shows will be the most awesome. Get ready Cincinnati (area), Grand Rapids, and Chicago. And if that isn’t enough December action for you… you might want to keep your schedule clear for everyone’s last night on Earth. We have something brewing for December 21st here in Nashville. In case you somehow missed the last mailer that announced how we updated our site with a new Digital Downloads situation… well… we updated our site with a new Digital Downloads situation. High quality MP3 and FLAC versions of our albums are now available directly from our own site. Check it out if you hate getting physical. On the other hand, if you still love touching things (and Olivia Newton-John), and the idea of giving away the things that you touch, it’s probably a good idea to start stockpiling ProtoMerch to prepare for the incoming Holidays. Give out the gifts that keeps on giving. Merch Stores are here: Zambooie and SoundMachine. END OF SALES PITCH AREA. It’s time to wrap this up, but I just want to let you know that things are going super swell in the studio right now. We hope to have something to show you from covers land you soon.